If we mess with money lenders people will go to loan sharks. 1. As they are regulated that creates a compliance cost of itself that loan sharks don’t have to contend with. 2. The type of lending undertaken is beyond ‘sub-prime’ and the default risk is massive. Unlike a loan shark who will beat somebody up, a regulated money lender only has recourse to the courts. 3. Security costs are high, this type of lending is done door to door and collections are usually done in the same manner, the majority of money lenders therefore have to hire security – something which loan sharks tend to do on their own (they are both lender and enforcer). Does this mean though, that such ridiculous rates such as 287% should be legal? You read that right, there are conditions which make some loans about 100 times more expensive than a mortgage. That is because something that isn’t in the ‘rate’ is the collection charge which can be as high as 14c on the Euro. Granted it is unsecured credit, as are credit cards, however the worst credit card rate is cheaper than the cheapest money lender rate. 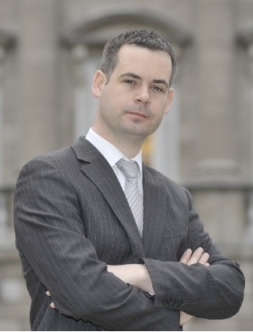 Pearse Doherty was attempting to do the right thing, but failed to realise that at every level the financial services industry has the government captured, in a free market it is also wrong to set price controls – something which was hinted at in shooting this idea down. 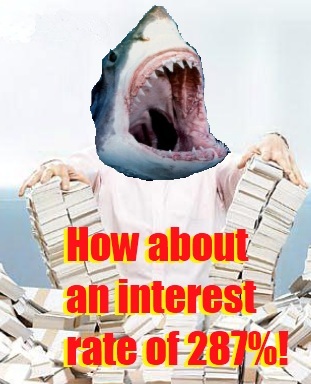 If 40% was too low why not try to find out what loan sharks are charging and see if there is some kind of benchmark? By regulating a company it lends credibility to their operation meaning people should actually be happy to deal with these lenders, but a cap on rates would push people to loan sharks we are told. The idea that a person would substitute this with an illegal operation instead is flawed, in particular if a loan shark is charging more – which is the implication (that by reducing the rate allowable that people would naturally opt for an illegal route instead due to an unproven potential reduction in available credit). Think about that – if you were to look for a drug that was available both legally and illegally (we’ll say Valium) and you had a prescription (in money that would be a loan requirement), would you go where it is cheaper or where it is more expensive and bought from a street dealer? On top of this, the state have no idea of the loan shark rates, the underwriting criteria they use (and believe me, even thugs have a business brain used to determine risk and reward), they also can’t prove that money lenders would stop operating, there is €100m of this lending in Ireland, suffice to say you can’t just ‘shut it down’ in the morning – and a cap on interest (even of 100%) would not ‘shut down’ anybody. Brian Hayes is mistaken saying that a certain rate would ‘close down the industry’ for several reasons, firstly is that there are only 46 of these companies in Ireland, if several left others would take their market share or new entrants would arrive with more efficient operations. Another question is whether there is a national duty to make loans available at any price just in order to have access to financial services? This lending is not a substitute for credit unions or credit cards, it is for people who don’t have access to credit often for good reason, so we bemoan sub-prime lending on one hand (when it is for assets), but support it explicitly on another when it is for consumables? I even have to laugh at some of the names of the firms, the first on the register is ‘abatis‘, seems like a reasonable name until you consider what an ‘abatis’ actually is, it’s a line of sharpened sticks embedded into a dirt mound facing an enemy so that when they charge at you they impale themselves. The justification for keeping them is that 17% of people don’t have a bank account, that doesn’t even make sense, because the answer there is to ensure access to a basic account which is effectively provided for under consumer protection regulation rather than allowing a certain industry to price gouge. And of course, there is the blatant hypocrisy of not opening a discussion about legalizing drugs and regulating them – so on one hand they don’t want people going to criminals via the semi-lucrative lending trade, but they will hand over the entire drug trade to them so they can make windfall gains there instead.